You know what they say – “you get what you pay for” or “buy cheap buy twice”. Both phrases hint at the idea that if you pay a low price for something, chances are it’s low quality. 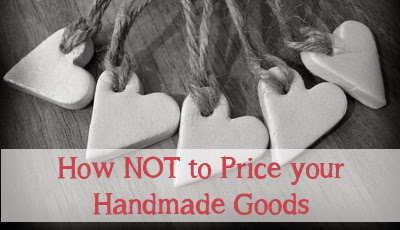 And yet, time and again, crafters are some of the worst when it comes to pricing their handmade goods. For many craft sellers it seems to be a race to the bottom in terms of pricing strategy, with the main thinking being that undercutting competitors will guarantee sales. We have lost count of the number of times we have seen crafters underselling their goods in the misguided belief that the lowest price is always the best price. Of course we know that this idea doesn’t bear out in real life. In reality, when you walk into a retail store cheap and cheerful products sit alongside luxury and the £3 lipstick doesn’t put the £23 lipstick out of business. Some small part of us knows there can’t be a huge difference in quality and yet feel assured by paying a higher price. Because price is the first indicator and differentiator of value, customers believe they get what they pay for and are willing to pay a higher price if they perceive a product to be ‘worth it’. All this means that the price you choose for your handmade goods says a lot about how YOU value what you make. Just as you meticulously research craft materials and painstakingly put together each item, so should you take time to find the right price for your work. If it is the case your items are not selling, try other things like better photography or better promotion before resorting to dropping the price. It’s easy to think that if you’re not selling, the price is too high. In the long run, underselling your work does more harm than good so you may indeed be pricing too low. If need be, raise your price – looking at other sellers of similar goods should give you an indication of the most people are willing to pay. It’s a little bit of trial and error, but with any luck you may find you’re worth more than you bargained for!